Art needs and deserves an audience and advocates. In our newest series, the ArtsNow Patron Spotlight, we’re putting the stories of our local arts patrons front and center. Today, we meet Hudson resident Tom Speaks. 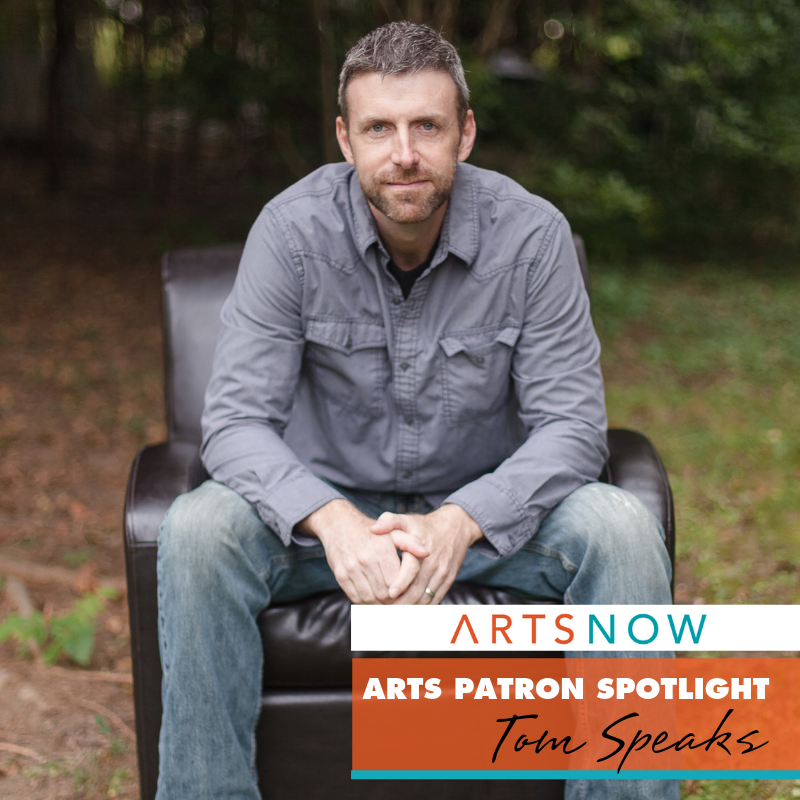 Tom is an arts and culture patron who puts his incredible talent in PR, strategic planning, and creative consulting to excellent use in supporting the then-fledgling Rubber City Jazz and Blues Festival. Your talents are a valuable gift to our creative community, Tom! Q: What is your earliest memory of the arts? When six years old in art class, we were tasked with making a paper mache sculpture. I worked diligently for the entire class period and was very excited to bring my vision to life. I’d produced a rectangle block the size of a very large shoebox. As the class was ending the art teacher approached and asked what I was creating. “A dinosaur!” I said proudly. “That doesn’t really look like a dinosaur,” my art teacher said. And I responded, “Well, this is just his foot.” I had BIG plans for that sculpture. Sadly, it was never completed. Q: What was your first introduction to the arts scene in Summit County? My parents took me and my sisters to a ballet performance at EJ Thomas Hall when we were kids. I was eight or nine years old and my sisters were younger. Total and complete disaster. A train wreck! This is still a Speaks Family topic of laughter. We’d had no introduction to the arts. Zip! “Theater” for me was only associated with Star Wars, popcorn, spaceships, and exploding aliens. My parents, God love them, wanted to expose us to the fine arts. They probably had just watched a PBS program or something. So, they arbitrarily selected a ballet. What the??? There was nothing on the EJ Thomas stage besides the dancers. No set to occupy our sugar cereal jacked minds. After 30 minutes of complaining kids with whiny statements like, “this is sooo boooooring! Can we go yet! Can I go the bathroom? Can we get more Starbursts at the snack bar? Why are they doing that with their toes? That’s dumb!” my parents gave up their dream of well-rounded children and we left EJ Thomas Hall to blissfully sink back into the pop culture abyss of Spiderman and Lucky Charms. (Special note to the ballet performers on that fateful day, I’m sure it was a fantastic performance. A belated ‘thank you’ to you all and a sincere apology for the disruptive ruckus we cretins caused in the upper left balcony). Q: How do the arts in Summit County impact your life? Art is beautiful. Art is necessary. Art and the practice of art by the professional and amateur alike, brings a sense of beauty and wonder that exemplifies what it is to be human. To be fully alive. Without art, the world would be a grey machine perpetuating a “bland essential.” My art is the written word. The bounce and rhythm produced by the written word has been a joy for me since my earliest days. Whether through my poetry or novels, writing allows me to fly. Just knowing that there are other creative spirits in Summit County that are open to help hone the craft, is invaluable to me. Also, the music scene has impacted my life profoundly as my son Liam is an aspiring jazz (and whatever other genre he chooses) pianist. The Summit County Jazz Community has been and continues to be an inspiration for Liam and our family. Q: What artist or arts organization in Summit County do you wish more people knew about? Akron Lit. Akron Lit is a group I have recently had the privilege to join as a Board Member. We are dedicated to assisting other literary groups in and around Akron flourish by helping with literature-based programming as well as sound fiscal, legal and structural practices to ensure stability and longevity. The goal of the organization is to help perpetuate a thriving and diverse literary community in and around Akron. How cool is that? Q: What is a “can’t miss” Summit County arts experience? Akron Jazz and Blues Festival is really terrific. A totally “Must Attend Event,” for certain. Theron Brown, Chris Anderson and Dan Wilson, some of the talented creators of the festival, bring their creative energy and generous spirits to event that has been graced with stellar line ups of world class Jazz and Blues performers. You gotta go!